One of my personal favorite toy companies is VTech and I am so excited to show you some of their exciting new innovations that are perfect for any child on your list this holiday season! 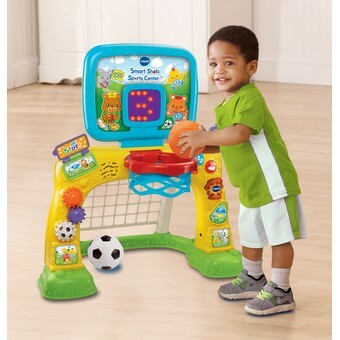 Parents can cheer on their little sports stars with the Smart Shots Sports Center. 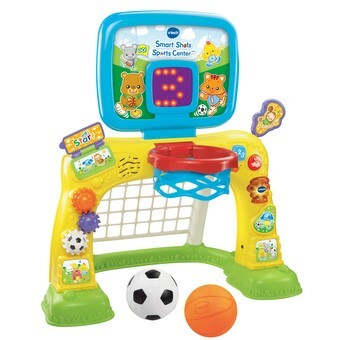 This electronic sports center features a soccer goal and basketball hoop for a fun 2-in-1 experience. Kick the soccer ball into the net to hear fun sounds or toss the basketball into the hoop and the magic sensor will count up to ten each time a basket is scored. Three buttons introduce shapes, numbers, opposites, sing-along songs and more. Turn the gears or flip the page to hear fun phrases and sounds. The sports center also features a light-up screen that plays a variety of fun animations and shows numbers, shapes and letters to reinforce learning. Score, win and learn with the Smart Shots Sports Center! Now children can perform and record like a rock star with the Record & Learn KidiStudio. Kids can explore a variety of musical instruments, adjust the tempo and sing-along to the music while recording a musical masterpiece to share with family and friends. 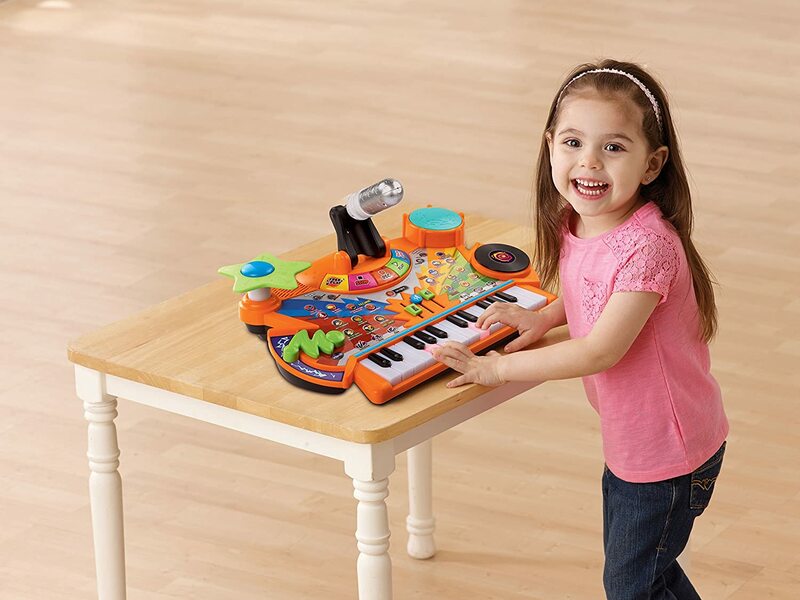 The light-up keyboard lets them follow the lights and learn to play their favorite melodies. 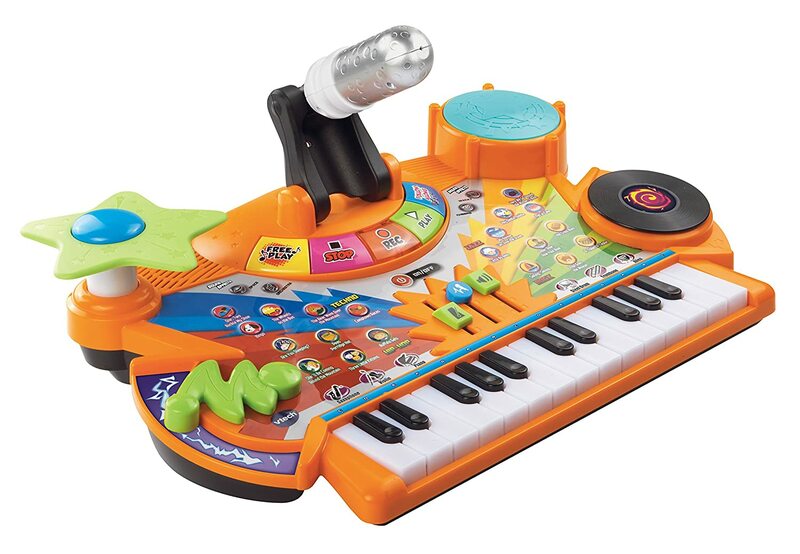 Kids can choose an instrument and use the keyboard to play that instrument's different sounds, or press the cymbal or tap along on the drum to add a beat to the song. They can even pretend to be a DJ with the scratch disc sound effect and speed up or slow down the tempo to match their style. Sing along to 20 melodies in Rock, Hip Hop, Jazz and Techno styles with a real voice-changing microphone. 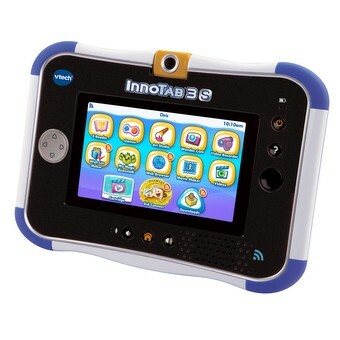 InnoTab 3S Plus lets kids learn, create and connect using a kid-safe Wi-Fi connection to the Internet. 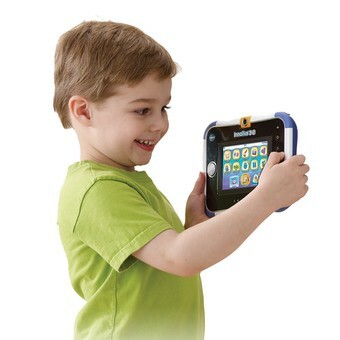 Now children can search VTech and parent-approved websites as well as communicate in real time with Premium VTech Kid Connect on their very own kids' tablet. Exchange text and voice messages, photos, drawings and fun stickers with smart phones using the exclusive app available for free on the App StoreSM and Google Play™. 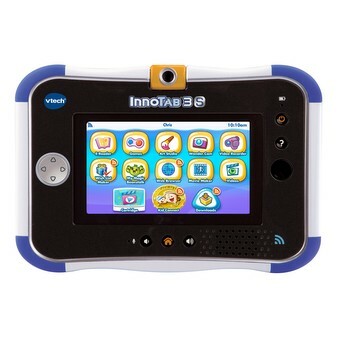 In addition to the Rechargeable Power Pack and 16 included apps, children will have access to more than 650 additional cartridges, software and apps that can be downloaded from VTech's Learning Lodge. The Wish List Maker lets children explore games, e-Books, videos, music and more, and send their favorites right to mom or dad’s e-mail. Movie Maker allows kids to become their own director, using their photos to create amazing movies. Unleash children's creative sides with Art Studio and watch them color, draw, paint and decorate with special stickers. Age-appropriate content includes a recommended age and grade range to meet each child’s unique needs. The expert-supported curriculum includes reading, math, social studies, handwriting, science, problem solving, geography and much more. Use the tilt sensor to interact with games, use the D-pad controller to choose directions and talk into the microphone to add to the fun. Children will love taking photos using the 180° rotating camera with over 55 special effects and using the video recorder to make movies. They can even import and listen to their own MP3s with the music player. Make sure to enter below for a chance to win one of your very own! VTech is generously offering (1) InnoTab 3S Plus to a lucky winner!